Opponents of raising the minimum wage, including business groups and chambers of commerce, often argue that proposed pay hikes would be a hardship for businesses, especially small businesses. But recent surveys refute that view. Eighty percent of 1,000 business executives surveyed nationally by Republican pollster Frank Luntz said they support raising the minimum wage in their state, the Washington Post reported earlier this month. And after California and New York approved increasing their state minimum wages – ultimately to $15 an hour in a few years – a majority of the 2,400 small business owners polled by the online small business community Manta said they also support higher minimum wages. In fact, 78 percent of them already pay their workers better than minimum wage. •	59 percent of small business owners are in favor of a higher minimum wage. •	40 percent already pay entry-level employees “far above” the required wage in their state; 38 percent pay “slightly above” minimum wage; and 14 percent pay state or local wages that are above the $7.25 hourly wage required under federal law. 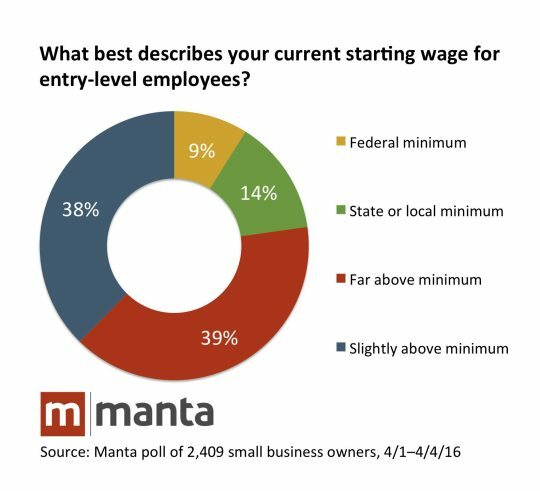 To be sure, 22 percent of the Manta respondents do currently pay some of their employees the minimum wage (Swanciger said the survey was not segmented to identify what type of businesses they are). While more than one-fourth of those business owners said they would not need to make any operational changes to afford to be in compliance with higher minimum wages, most said they would. How? Thirty nine percent said they would charge more for goods and services; a third would reduce staff; around one-fourth would either cut hours or be unable to expand operations; and 9 percent said they would need to cut back hours of operation. Another 20 percent of respondents said that complying with a minimum wage hike would enable them to attract higher quality candidates. Which begs a question: Why wait for the law?